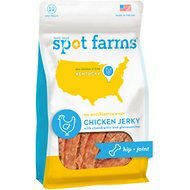 Spot Farms Chicken Jerky with Flaxseed & Vitamin E Dog Treats are all-natural chicken jerkies designed to help promote your dog’s health and happiness, all with a delicious flavor your dog will love. Made with antibiotic-free, USDA-certified, all-natural chicken from family farms in Kentucky. These wholesome treats contain omega 3-rich flaxseeds and vitamin E-rich sunflower oil to help support your dog’s healthy skin and shiny coat. Made with nutritious, human-grade ingredients like antibiotic-free USDA-inspected cage-free chicken. Chicken, Organic Cane Sugar, Vinegar, Sunflower Oil, Flax Seed, Alpha Tocopherol Acetate, Rosemary Extract. Sometimes it may be hard to find a treat that tastes as good as the ingredients it’s made from. That’s why Spot Farms created a range of jerky and soft-chew treats, specifically designed to give your dog the deliciously succulent taste he goes wild for, while getting the benefit of high-quality, human-grade ingredients he deserves in every bite. At Spot Farms, nothing is hidden. All recipes start with meat as the main ingredient and are fully free of animal meal and fillers like corn, wheat or soy. The ingredients you taste are the ingredients you get–it’s as simple as that. To ensure exceptional quality, Spot Farms uses USDA-approved meats raised on family farms and cooks each food item in small batches in its U.S. kitchens, using simple, wholesome recipes your pet will love. Not only are Spot Farms treats nutrient-packed and delicious, they also provide specific health benefits to your furry friend. Selections are vast and created to cater to each dog’s needs, regardless of age, health and activity level. Hip & Joint Dog Treats: These jerky treats are specially made with chondroitin and glucosamine to help your pup maintain healthy hips and joints. They’re also a great source of turmeric, which has natural anti-inflammatory properties. Skin & Dog Coat Formula: All-natural chicken jerkies with sunflower oil rich in Vitamin E, flaxseed rich in omega-3, and brewer’s yeast for vitamins B and E, are specifically designed to support a healthy skin and shiny coat. In addition to the classic foods and dog treats, Spot Farms offers a range of soft, chewy treats ideal for smaller dogs and pups, who have a harder time consuming big chunks of meat. Loaded with the same rich flavor, these treats are easily broken apart, making them perfect for training and rewarding your pup for a job well-done. Spot Farms sets out to make the best food and treats for your dog using the finest, 100% human-grade ingredients available. Partnering with family farms across the country, their mission is to bring each pet customer the very best regionally grown chicken, turkey and pork raised without antibiotics. 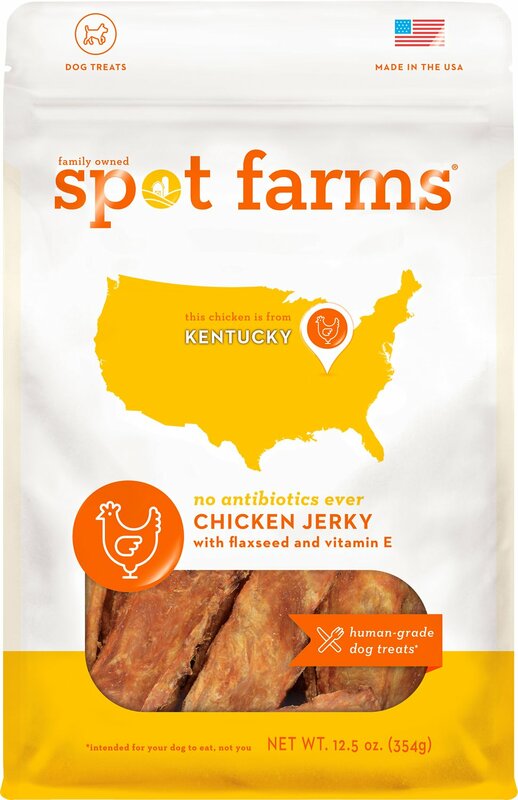 Spot Farms proudly makes all of its food and treats in the United States, using regionally sourced, high-quality ingredients and never any artificial colors or preservatives. My dogs loved them. Smells like chicken you just cooked. Excellent tasty source of protein for my dogs. Would highly recommend them. I was worried about trying a new brand since the other has been discontinued. My pup loves them just like the others. 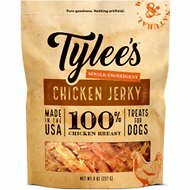 All three of my dogs are crazy loco for these chicken yummies! My 38 lb dunnowhat, my 17 lb doxie/spaniel (who is extremely picky), and my 5 pound Pomeranian (with only 7 teeth!). They hear the bag and suddenly I’m surrounded! 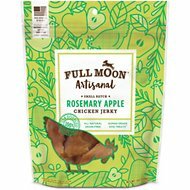 These treats smell great, are easy to break, and are *just* crunchy enough for all three of my babies. Definite their favorite treat. I chose these because they had Vit E my girls have dry skin & severe itching every year around October. Between these treats & salmon oil the itching is totally gone plus they love them! Fritz and Otto love these healthy treats. They take turns licking the bag when it is empty. Great product for a dog that loves to chew, but isn't that into rawhide. One of the best treats!!! My dog really likes this brand and especially that one. He will run and asks for a treat. They are soft and easy to break on a small pieces. My husky buddy is almost 16 (wow!) and has stopped eating his dog food and most biscuits that he had loved. I was already a pleased customer, so I researched on Chewy. com for chews that Yukon might eat. Success! He loves these and is able to chew them. My dog is very picky with food and treats. I like it when I can find things she likes. I’ll find something at a local pet store whether chain or independent and when I go back they’ll not have them and move on to something else. She is so picky I waste so much money on treats.